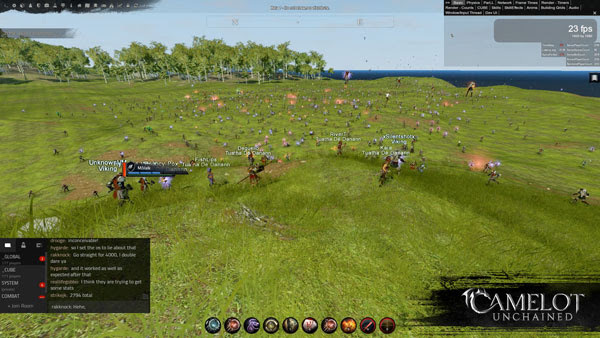 How do you define a massively multiplayer battle? One of our Backers asked on our Forums whether, based on what they saw today, we should use a new phrase instead of “Massively Multiplayer” to define our battles. That’s because of what our tests today showed as we continued our ongoing testing of the improved ability system. We had over 2,809 (which is why the date for this update is 2809!) ARCs (Autonomous Remote Clients) and players moving around an open battlefield using abilities, more often than we expect most players to do! Wrap your heads around that folks: 2,809 players and ARCs running around the screen in the same battle, in a tiny, by industry terms, space. And not 2,809 NPCs, but 2,809 connected clients, consuming bandwidth/servers like players and using the server-based physics system. That’s a heck of an achievement for the team, especially when you think about the fact that “500 people in the same battle, at 30FPS” was the goal we stated during the Kickstarter. While there is still more work and performance improvement ahead, these numbers are much increased over our pre-Beta 1 numbers on the old system! If you have not yet had the opportunity to see the action, you can join us for testing this weekend, as we welcome our Beta 2 Backers in for another test, just like we did today! Ability scalability tests: Using our ARCs (Autonomous Remote Clients), we have been stress testing the new ability system, which is performing far above our pre-Beta 1 scalability tests using the old system! We have shown 2,809 ARCs and players on the battlefield using abilities, more often than most players are expected to, which further stresses things. There’s still more work and improvements to be done, but the results this week are fantastic! Almost 3,000 connected clients using abilities, running around, etc., and we are still in Beta 1! WIP – Art/Tech – VFX: Wylie worked on the trail shader in order to optimize VFX to increase performance. The first iteration is on Hatchery, and additional work on trail texture mapping is on its way. We should be able to rework existing trails to use the new shader soon. 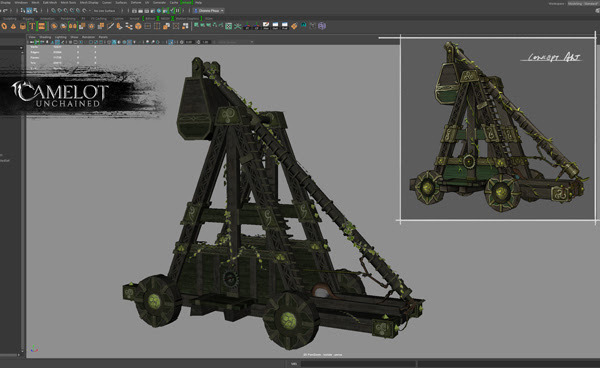 Mike has finished the new VFX for trebuchets, and has made some explosion improvements for scorpions. He is also creating new VFX for the sapper bomb. WIP – Improved Ability system: The gameplay team has been working on bringing the updated ability system to life per our testing. The mages will be the first class to get the improved ability system love, followed by the existing heavy fighter, archer, and healer classes. WIP – Rubble improvements and damage: Colin worked on making building rubble falling on you hurt. He is also working on building-related optimizations and fixes. This includes generating collision geometry on the building server (instead of the physics server), and figuring out why rubble sometimes falls through the terrain. Tech – Tools: The unsung hero is always the tools guy. This week, Bull updated our content pipeline to use some new MongoDB features, allowing us access to new programming tricks we can use on the server, build server, and editor. Additionally, he hit several bugs that should help improve the workflow of several of our artists. He also updated Platypus, allowing artists to more easily spin up the zones they want to test. WIP – UI improvements: AJ got the battlegroup UI pushed and hooked up, and players will soon be able to create battlegroups! He also added a search feature to the building UI, and completed the last fixes on the new crafting UI. Pending final review, the crafting UI should be testable by players shortly. Art – Realm trebuchet skins: Dionne, whose birthday is today (Happy Birthday, Dionne! ), has finished the Viking and TDD trebuchet skins. Joe is currently completing an initial rough pass animation on them to get them in testing next week. 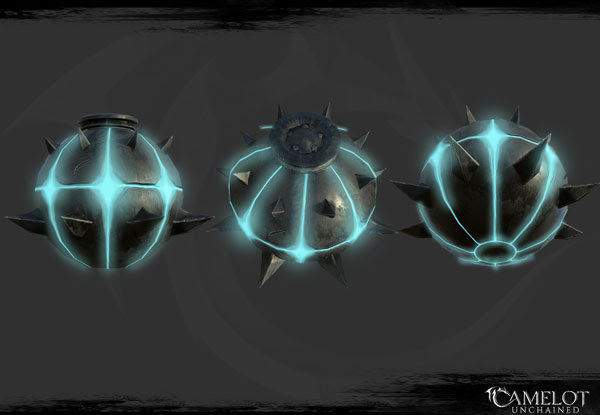 WIP – Design – Siege Magic Mortars: Ben is working on the design for “magic mortars,” a new type of siege engine. 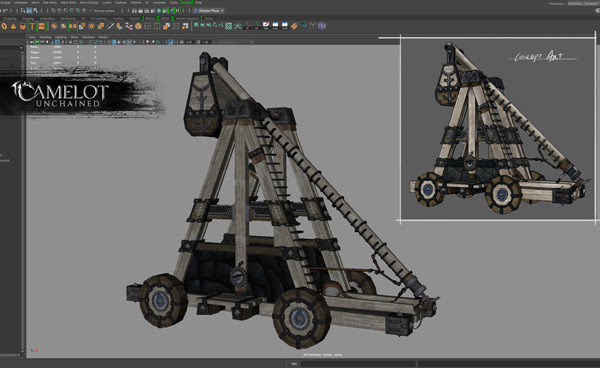 He is also designing new ammo types for our existing trebuchets. Lots of testing: The artists have vetted most of the new assets, fixing any major bugs and pushing the minor ones until after we get everything working on master. The final step is finish ironing out bugs on the code side, so our characters don’t occasionally look like Cthulhu creations! Rigging: Joe has added the new Luchorpán and Human undergarments to the master rig, as well as the Luchorpán-specific TDD armors. WIP – Updated Valkyrie: Scott and Tyler set up all the equipment parts for the Valkyrie in preparation for the final assets going in next week. You can see the updated models in last week’s update. WIP – Animation – Luchorpán: Sandra continues to work quickly through a first pass re-target of the existing animations needed to get our new Luchorpán up and running. We expect this to wrap up early next week for importing and testing. WIP – Art – Giants: In anticipation of new races down the road, Jon has been working to update our old giant models to the new 2.0 update. This will help us determine the details and time needed to get a wholly new race into the game. 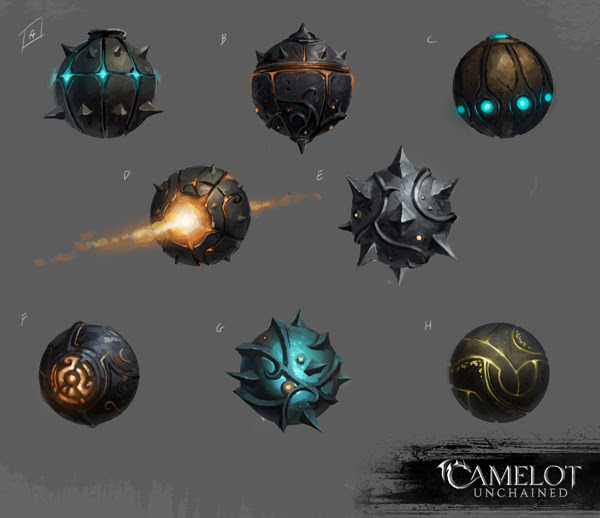 Art – Concept – Sapper Bomb: Michelle created a bunch of great concepts of a sapper bomb to replace our holiday Xmas gift. Jon has already created the model which, Tyler is using to update the current holiday themed assets. For art this week, we start off with images of the skins for the Viking and TDD trebuchets from Dionne, with side-by-side comparisons to Michelle’s concept art. You can find the previously-completed Arthurian version shown last week HERE. Next up, we have concepts of sapper bombs from Michelle. This is followed by an image of the model created by Jon. 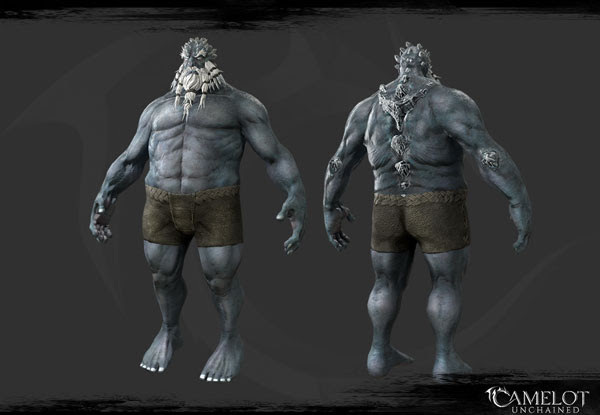 Next up, we have an image of the updated male Frost Giant from Jon. While these guys are not planned to go in immediately, we wanted to prep the old art to determine how much time it would take to get the work done, including setting up armor for them. 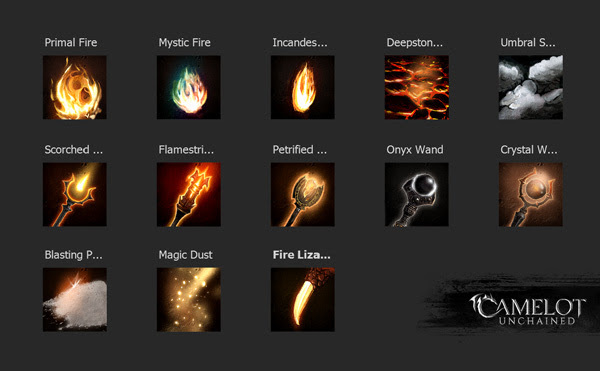 James continues his epic journey through the land of ability icons, this week working on icons for the Flame Warden, the Arthurian mage class. MJ here with a few thoughts after today’s test and livestream, and some screenshots I took during the test! For those who couldn’t make it to today’s test, here’s a screenshot from early in the test, when we only had 2,248 Backers and ARCs in the game. I know, *only* 2,248 in the battle–the engine was barely stressing out yet! But as you can see from all the pretty lights, and the Backers and ARCs sent flying into the air by the AoE knockback (more like “knock into the air”), a lot of fun was being had by all. If you look closely at the shot, you can see how the flying folks were in the middle of doing things (walking, using abilities, etc.) when they became airborne. Now, if we added some ragdoll physics to that, you would have much hilarity. This shot was taken while we were pushing towards 2,800 ARCs and Backers. We hadn’t quite gotten to our peak, but we were very close. The server was still working even at this point, but it was definitely feeling the burn. We’re getting close to 3K, and we might be able to break through that ceiling next month. OTOH, we can live with 2,809. 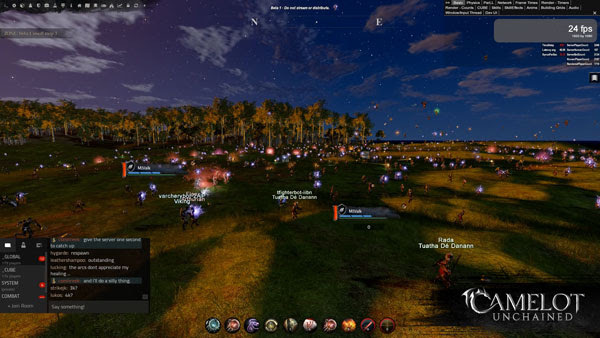 One important thing to take away from this testing is not that we need, nor necessarily want, 2,809 players in a typical battle for Camelot Unchained. However, if we can handle 2,809 players in a battle from both the rendering side and the network side, that means we have the rendering/network bandwidth to improve the look of the game and also throw in NPCs, crazy siege engines, VFX, and more. This bandwidth allows Ben and me to expand our vision for what a battle can look and feel like. It is quite freeing in that way. It also means that if we can do that, but not require the best CPU/GPU to play, more people can play our game. It is still too early to say that we have succeeded. However, it’s not too early to say that these tests prove we have spent our time wisely, and that we are delivering on the tech we need to allow us to then deliver a great game to you, our patient and wonderful Backers. And back to me, Tyler – That’s it for this week! Remember, we have a short test going on this weekend that showcases the large battles we want to support in the live game. To reiterate, we were shooting for a minimum of 500-player battles during the Kickstarter, and have clearly surpassed that! We have lots of cool things coming soon. Stay tuned each week to keep an eye on our progress, or feel free to jump into our forums and let us know what’s on your mind!